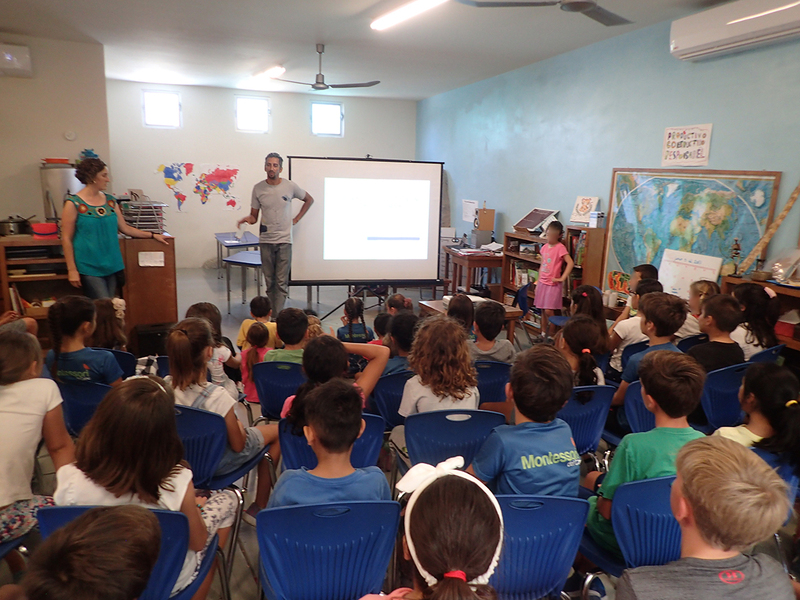 In collaboration with Montessori Del Cabo, Ocean Sanctuaries, Dive O’Clock and World Oceans Day. I spent the last three days working with the students and guides of Montessori Del Cabo, a Montessori school in San Jose del Cabo, BCS, Mexico. In preparation for our contribution to the World Oceans Day celebrations, I went along to raise awareness about plastic pollution in the world’s oceans and how it is harmful to all life including our own. 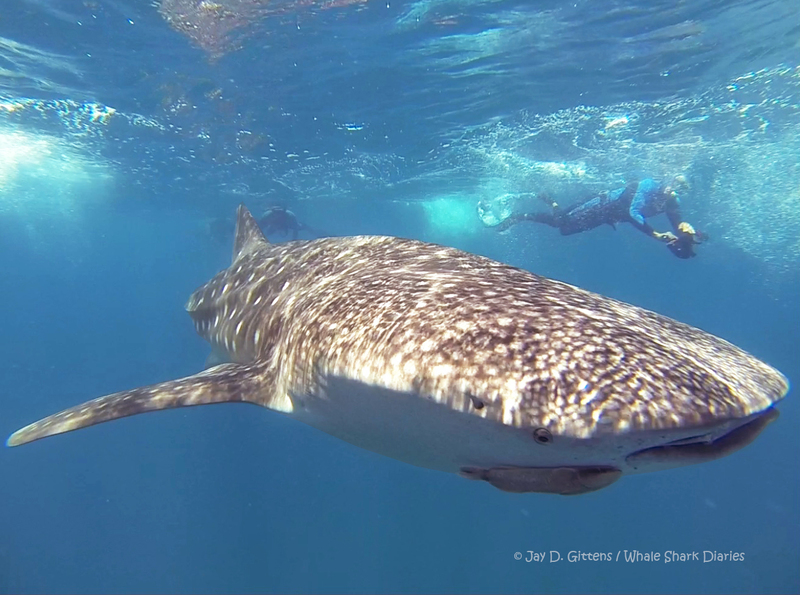 Of course I also talked about my favourite of all species, the whale shark and the goals of our project, Whale Shark Diaries. World Oceans Day is “a global day of ocean celebration and collaboration for a better future”. Individuals, groups, schools and communities from around the world organise and participate in events and activities in celebration of our oceans and in doing so, they help to raise much needed awareness. Talking about plastic pollution and the need to reduce our consumption of single-use plastic items. Faces obscured for privacy. 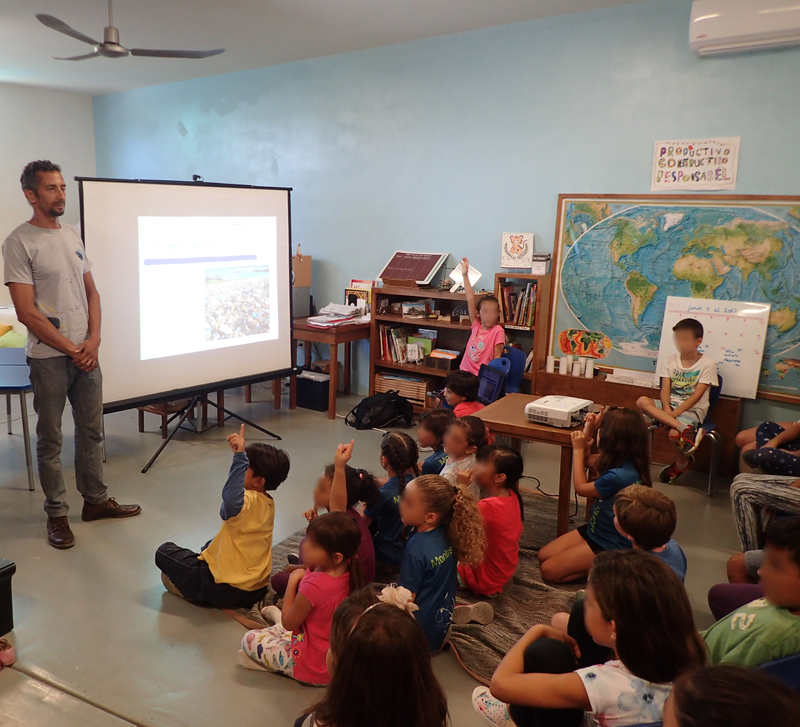 Our event for this years’ celebration began on June 5, 2017 when I went along to Montessori Del Cabo to have a conference with the students and “guides”. In total there were 56 children between the ages of 6 and 12 and six guides. We started off with a presentation about the problem of plastics in our oceans and discussed the human and physical factors that contribute to this global issue. The kids were very engaged from the outset and were quick to ask questions and offer their contributions. They were then shown a short video which illustrated the problems that plastics in the oceans have on our fragile environment and wildlife. Talking about whale shark biology. Thanks to Rita for translating my talks into Spanish ensuring all the kids understood. We then went on to talk about the whale shark, Rhincodon typus, and the goals of Whale Shark Diaries in terms of helping to protect the species through collaborative research, awareness and education. The kids and staff received information about the biology, life-history and conservation status of this endangered animal. Hands were up throughout the entire presentation and the kids (and staff) had many great questions to ask. After the presentation and questions, we watched a short video of a famous whale shark rescue at the Revillagegedo Archipelago (aka Socorro Islands) whereby an adult female whale shark was freed of rope that had become entangled on her, cutting deeply into one of her pectoral fins. The children were very happy to hear that this whale shark was later encountered and said to be in good health and pregnant. We then watched a video that I shot myself (edited by former Whale Shark Diaries intern, Bethan Ward), of whale sharks swimming and feeding in the Bay of La Paz. 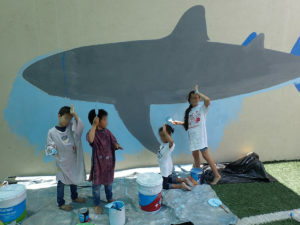 After this, the students went home and I stayed behind to make the initial preparations for the whale shark mural. I am no artist and getting the shape and proportion of the five metre whale shark was very challenging, especially in the intense heat. Teaching a group of our young artists and new environmental activists the international sign language for “there is a shark”, should they ever need it! On day two the students came in small groups of five to start painting the mural. I only did the shape of the shark and they were guided to do the rest. We painted the ocean and changed the colour of the whale shark from blue to its more natural colour of grey. We also adapted the shape of the shark a little as we went. During their school activities, some of the kids produced some work related to the whale sharks which included drawings and investigations. A student paints yellow pilotfish above the whale shark. Face blurred for privacy. 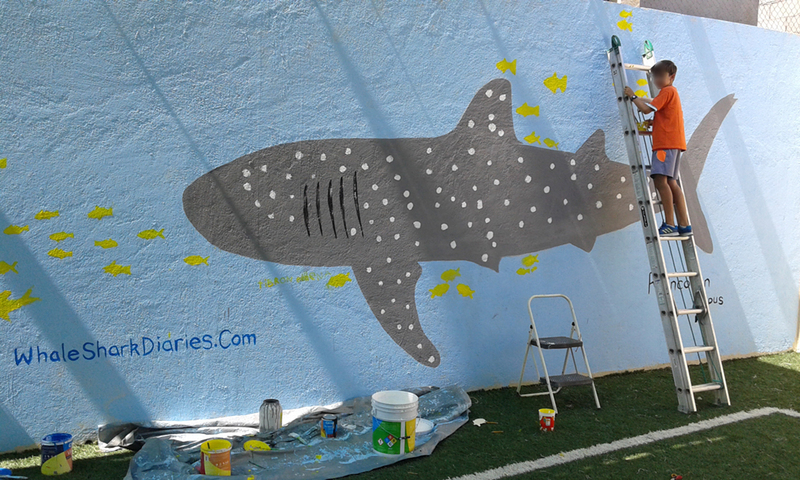 On day three we continued to add the whale shark’s spotty pattern and the yellow pilotfish around it. All went well. There are still a few finishing touches to be done by the students once they have finished their important examinations over the rest of this week. Our 8 metre mural. The whale shark is approximately five metres in length. It requires some finishing touches including some eyes and a mouth for the shark as well as detail to the yellow pilotfish and a World Oceans Day logo. We just ran out of time! The kids really enjoyed creating this mural and it was satisfying to see its development. Well done guys!! On June 6, the second day of working with Montessori Del Cabo, a small group of the students went on a trip outside of the school which ended with them going for a juice at a juice bar. When their juices were served to them in single-use Styrofoam cups with straws, the kids immediately went to work by talking constructively to the juice bar owner about the global problem of plastics in the oceans and the need to reduce the use of single-use plastic items. The owner listened to the concerned children and then invited to them to make a poster about the topic which he will put on the wall in his establishment. When I learned of this I was positively shocked and I felt so good that my visit had had an instantaneous positive result on the students. I was also so very respectful of how the establishment owner worked with the concerned kids towards promoting a resolve. Though at times, when travelling back and forwards between La Paz where I am based and the school (6 hour round trip each day), I wondered if I had bitten off more than I can chew. But by this point I realised just how important this work is and it was most definitely worth all the hard work and travelling. The future of the planet belongs to its children. As teachers, guides, parents and guardians, our contributions to their development will have a direct influence on who they become therefore it is vital that we guide and educate them (and ourselves) about the environment so they have the tools and the knowledge to live more sustainably, protecting the future of their Blue Planet. We also teamed up with Dive o’clock to produce some information about the whale shark tourism industry and how to choose a responsible tour operator, to help secure protection for the species. The post, which was written by blog owner, Marlies Wolters, was shared extensively throughout social media to maximise its reach. You can read it here. 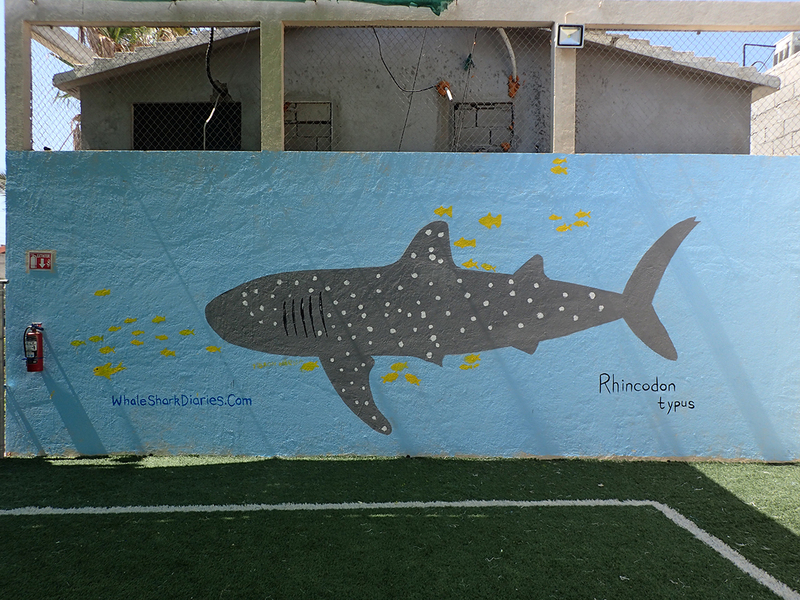 Through responsible tourism and our conservation internship program, Whale Shark Diaries raises funds which are of course used to take whale shark tourism participants to see whale sharks in La Paz, BCS, Mexico. But it doesn’t stop there. During these informative trips we take whale shark identification photographs and share our encounters to the Wildbook for Whale Sharks, a global photo-identification library and visual database of whale shark encounters and of individually catalogued whale sharks. This library is maintained and used by marine biologists and citizen scientists to collect and analyze whale shark sighting data to learn more about these amazing creatures. Also we use the funds raised to offer events and activities free of charge to schools in Baja California Sur, Mexico just like the event hosted for this World Oceans Day. If you like the work we are doing perhaps you can support us. For the awareness and education part of our project, we desperately require transportation to get the team to schools around the state so that we can share our message and positively influence the lives of the children thus the future of our planet. You can support us by participating in one of our informative day trips to encounter and swim with the whale sharks in La Paz, Mexico or by participating in our internship program. Also you can support us by donating to our fund raiser for transportation for the team. Details can be found here. (Please note, some donors had a few issues when trying to send their donation. If you experience any issues at all please, please inform us so that we are aware of any problems. Montessori Del Cabo is a school that, as the name suggests, uses the Montessori method of guiding their students through their education and development. When I approached the school by email, I was immediately invited to discuss an event in celebration of World Oceans Day. Rita and her team were extremely helpful in getting my ideas into motion and also, whilst in discussion with some of the staff, I learned of ways that I can improve such events in the future going forward. In my three days at the school I witnessed the dedicated staff guiding their bright, enthuasiastic students through their education. You can find information about Montessori Del Cabo here.. Dive o’clock is a SCUBA blog about dive education and travel with marine conservation as a common thread. Marlies Wolters is a Dutch dive instructor travelling the world. On her blog you can get inspiration for your own dive and snorkel adventures, compare dive destinations and learn more about marine life species and sustainable dive and ecotourism. Marlies helped us to publicise our event on her own blog, on the World Oceans Day website and their corresponding Facebook event group as well as helped us out with ideas for our celebration. You can visit the homepage of the blog Dive o’clock blog here. Ocean Sanctuaries “is a non-profit organization dedicated to collecting crowd-sourced data from collaborative non-professionally trained individuals to observe ocean life. We use the information collected to educate people around the world through lectures and documentary films. Our joint efforts promote knowledge and awareness of the oceans and allow people to live abundantly”. Barbara Lloyd and her team have helped us out in several ways including participating in our internship program, joining boat trips, helping out with data processing and donating directly to our educational fund raiser. For World Oceans Day 2017, Ocean Sanctuaries helped with the publication of our celebration. You can learn more about Ocean Sanctuaries here.